Snooping website site Internet Eyes has ambitious plans to charge businesses £20 a month in order to have their CCTV cameras monitored by site members, but it has yet to go live because it's the subject of an investigation by the Information Commissioner's office (ICO), which believes it may be illegal. 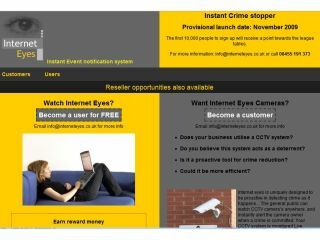 In December we reported on the site's plan to offer eagle-eyed members the chance to win £1,000 for spotting crimes on CCTV. Although viewing live CCTV feeds online is illegal, the site hoped to work around the ban by making the feeds unlabelled, as it would keeping anyone watching and reporting a crime anonymous. Assistant Information Commissioner Jonathan Bamford has met with Internet Eyes as well as some of the businesses that had signed up for its observation services. He said: "The ICO is reviewing this response to assess whether the scheme complies with requirements of the Data Protection Act." Everything remains on hold, apparently pending a decision by the ICO. Earlier this month on the site's blog, Internet Eyes noted: "Due to further stipulations arising with the ICO (Information Commissioners Office) we are delaying launch until these items are dealt with and approved. "We take the ICO's views very seriously and are keen to work within their guidelines. We'll keep you up-to-date with progress..."